Please see the results of the informal audit of the balance sheets of VoxUkraine and the related statements of income, earnings, and cash flows for the year of 2015 here. Over the course of the year, VoxUkraine have been working to promote accountability and transparency of the Ukrainian government, facilitate informed public debate on key policy decisions, support development of market economy in Ukraine, working to strengthen democratic institutions, and raise the level of economic discourse and the quality of analysis. In November 2015, thanks to the colleagues from the judicial firm Integrities, who volunteered their time, VoxUkraine registered its own NGO as the next step of its development. This NGO will allow VoxUkraine to receive funds directly and develop as a separate and fully independent organization, which supports the efforts of a large group of volunteers. VoxUkraine is an independent, non-partisan initiative. Since the very beginning, VoxUkraine, as well as all the authors and other contributors, have been producing the high quality content and providing their expertise on the volunteer basis, although covering the work of some of our team members – Social & Community Manager, Researcher, Manager of the Essay competition MindSketch, compensating for translation, data processing and programming, etc. 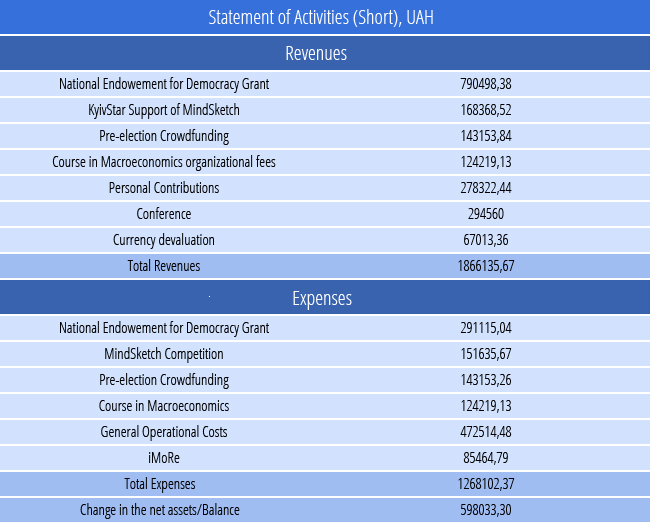 42% of the revenues of VoxUkraine came from the donor, the National Endowment for Democracy, and 9% from the corporate support – the company KyivStar financing the essay competition MindSketch. The rest of the amount came from the organization of the conference together with the Kyiv School of Economics, personal contributions, and organizational fees. 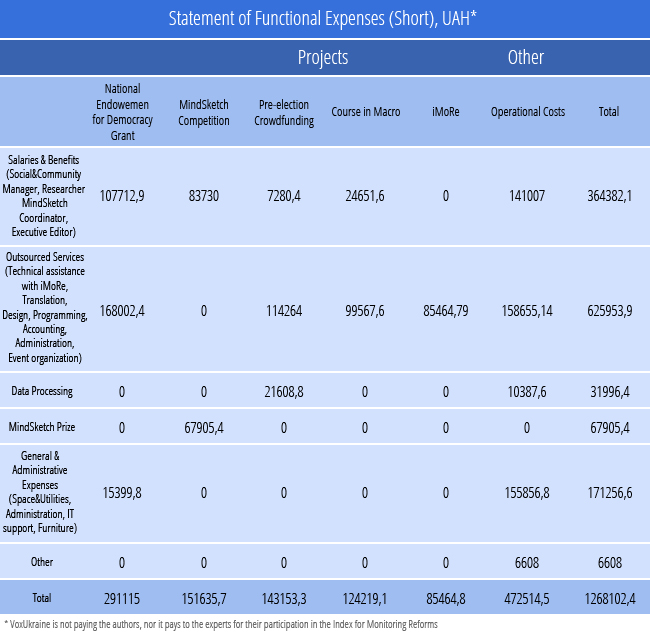 The change in the balance on the graph below is positive reflecting 1) the part of the funding of the National Endowment for Democracy for the January-April 2016 (this is a one year grant for the period May 2015 – April 2016), and 2) unused portion of the personal contributions which is planned cover some of the operational expenses in the beginning of the 2016 fiscal year. 23% of the year revenues VoxUkraine received from crowdfunding and personal contributions, and 7% more in the form of organizational fees from the individuals (30% total). Over the course of the year, 95 people made donations to VoxUkraine (See the distribution below), and 15 of them made more than one donation. 125 people more contributed in the form of the organizational fees. The average size of the contribution was 163 USD, while the median – 30 USD. From the graph the one can see that only 3 one-time donations amounted for more than 1000USD, with the maximum at 5000 USD. Symposium Program “Ukraine – Escaping from its Post-Soviet Legacy” (together with the Kyiv School of Economics). In April 2015 VoxUkraine organized a high-level Symposium gathering some of the best minds in economics, political science and related fields to shed new light on developments in Ukraine. The symposium was a truly world-class event and was exceptionally well received by the international and domestic community. One hundred academics and policy makers took part in the panel discussions, including 5 Ukrainian ministers (Natalie Jaresko, Aivaras Abromavičius, Volodymyr Demchyshyn, Andrii Pyvovarskyi, Oleksii Pavlenko), the head of NBU Valeriia Hontareva, the head of Naftogaz Andriy Kobolev, US Ambassador Geoffrey Pyatt, the Head of the EU Delegation, Ambassador Jan Tombinski. Forty one participants came to Symposium from the US and the EU. Almost 400 guests visited the event (more details can be found here). This symposium will be the first of a series of annual high level VoxUkraine gatherings. Five top officials of the National Bank of Ukraine, the VoxUkraine Editorial Board and Advisory Board members, Professors of the Kyiv School of Economics and the NaUKMA, IER researchers participated in an educational series organized by VoxUkraine, a 2-day course “Ukraine: An insider’s view on macroeconomics, central banking, and monetary policy” where leading economists and policy-makers explained the economic grounds of the current situation in Ukraine and share their expectations about its future prospects. This event (joint with the KSE) attracted more than 200 participants. Check the Videos of the event, especially the introductory remarks of the Chair of the NBU where she talks about VoxUkraine. VoxUkraine, with the help of iMoRe experts and financed by the company Dragon Capital, prepared a video for the annual high-level Forum “Yalta European Strategy” (YES) explaining reforms. The English version of the video got 22,818 views and got a very positive feedback from the YES participants, and other viewers. Analysis of how the Parliamentary parties follow their party programs that they have announced before the parliamentary elections. Ranking of the candidates to Mayors in several largest cities of Ukraine – Kyiv, Odesa, Lviv, Kharkiv, Dnipropetrovsk. Guidelines for the voters on what claims in the rhetoric of the candidates should alert them not to vote for them.